Posted in General Health & Wellness on June 4, 2012. Last modified on April 23, 2019. Read disclaimer. The cost of gas is rising all over the United States. The fuel we paid $0.99 for in the year 2001 is well over $4.00 per gallon in many locations. As prices continue to go up, many people are left thinking about how to stretch every gallon. Here are a few tips that will help to increase the fuel economy of your car and hopefully keep more money in your pocket. The price stickers on cars have more information than just the price. The fuel efficiency estimate is also printed in the user manual or available through a Google search. If you can find a car which guzzles less gas it is a step in the right direction. Most people like to get to where they are going as quickly as possible. However, those few extra minutes may be costly. The more you accelerate the more gasoline will be used. The faster you go the harder the engine has to work. Keep your foot light on the gas pedal so that you can go farther on less fuel. OrangeCountyHealth.com is a participant in the Amazon Services LLC Associates Program, an affiliate advertising program designed to provide a means for sites to earn advertising fees by advertising and linking to amazon.com. This is one place where a little bit of speed is helpful. Getting to the top of the hill at a good speed allows you to cruise without acceleration to the bottom giving you a boost in fuel efficiency. This is a very easy way to lay off the gas. When driving on the interstate use some safe and careful driving tactics to increase your gas savings. Try weaving less between cars as you are driving past. Make sure you are driving at a good following distance so you do not have to stop suddenly. Maintaining a steady state of speed also keeps your vehicle from overworking. Every time you press on the gas pedal you are using fuel to power your car. Finding a cruising speed and staying consistent is key. It takes more energy to start and stop than continue in motion. Harness the momentum already created. When you do need to pick up speed do so patiently instead of punching it to the floor. If you are like most people you are carrying an extra 50 pounds rattling around in your car. Automobiles are heavy by nature. Fueling them to move requires substantial energy. Lighten the load of your car as much as possible. Used bike and roof racks add weight and increase the drag effect. These bulk items catch air and make your engine work harder. 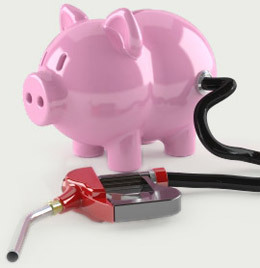 Having routine maintenance done such as oil changes, tire alignment, and replacement of the air filter saves money on fuel and could save you the headache of breakdowns. If you car's get up and go has got up and went check the spark plugs. The tires should be checked at least twice a week to make sure they have the right pressure. Low pressure on your tires can cost you money at the pump. Say you are planning to go to the grocery store, the post office, and the bank. Is there a route where you can most efficiently get to and from each location going the shortest distance? Often time we plan what is required to be done, but do not plan what is the best way to do it. If going to several stops during the day is a 'must' then try to travel as little as necessary to get the tasks accomplished. Another option is to save all of the errands for one trip. The latest craze is to save money in fuel by purchasing a hybrid car. There are many evident reasons why this is in a new car buyer's interest. Almost every car manufacturer is producing models to run on both gasoline and electricity. The new line of vehicles has been designed to have better aerodynamics leading to less wind resistance and brand -- new engine design. The vehicles are produced of lighter weight materials while using the latest accident technology. Choosing a hybrid can equate to significant savings on gas. As the heat of summer fast approaches, most people turn on the air conditioning without a second thought. Next time before you push the AC button, think again. Any time the car has to give more energy it does so out of the fuel tank. Pre-planning trips and knowing the stop signs and street lights can also help you to save money. This fore-knowledge allows a driver to slow down and avoid hard stops when appropriate. Knowing the area assists in keeping a regular speed and taking the best route to avoid traffic snarl ups. Public transportation, walking, and riding a bike cut your trip fuel expenses to zero. Numerous large cities have Park and Ride programs which are low cost and save a bundle at the gas station. Now that you know a few tips on how to save gas, you can incorporate them into your lifestyle. Saving fuel is good not only for your pocketbook but also for the environment. Try these tips today and enjoy the benefits almost immediately! If you have additional tips for cutting fuel consumption or improving vehicle gas mileage, we'd love to hear them. Please add a new comment below! Comment at Cellphone radiation precautions: "I wonder about the possible concerns about tablets/ipads? Do..."
Comment at Prostate cancer risk factors: "It sounds like men that eat a lot of dairy..."
Comment at Getting on a healthy walking routine: "Good artice. Here are a few more walking tips from..."
Comment at 3 Very popular plant-based diets: "Having spent a lot of time in Italy and Greece..."